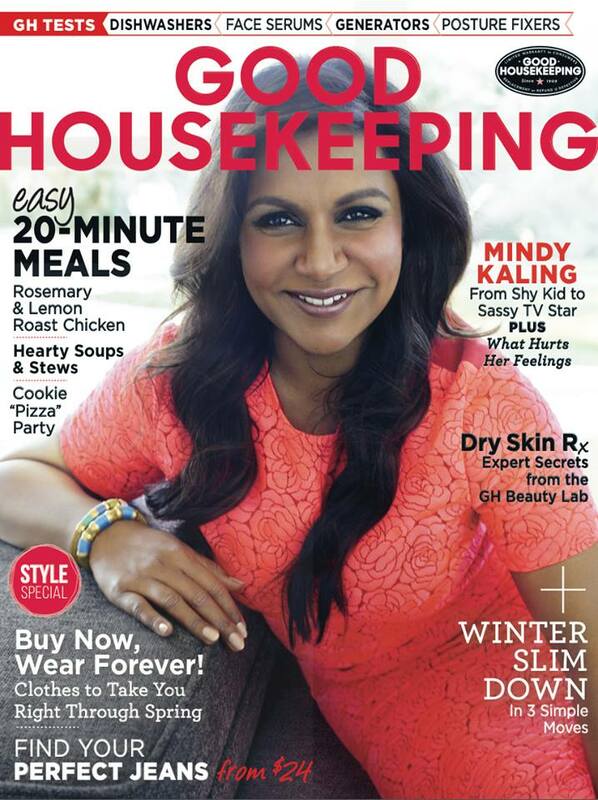 Mindy Kaling on the Feb 2015 issue of Good House Keeping. -I’m not in love with the cover, but Good Housekeeping’s feature on Mindy Kaling is pretty great, especially the part where she talks about her late mom. –Kevin Hart‘s new movie looks terrible, but at least he’s having fun on the promo tour. Here he is getting slap-happy with Jimmy Fallon. -Meanwhile, Kevin falls in love with Aidy Bryant in his new SNL promos. -If this video of Force Majeure’s director reacting (and freaking out) to his Oscar snub is real, it’s pretty damn heartbreaking. -Well, this is awkward. Jennifer Aniston had to cancel a scheduled junket to talk about her Oscar nomination. -On the plus side, at least she managed to avoid Angelina Jolie at last night’s Critics’ Choice Awards (while wearing a much better outfit). -Fifty Shades of Grey is already selling out. Sigh. -The cast of The West Wing reunited to talk about cheese again. This will never get old. –Kaley Cuoco is still not a feminist but she’s really happy, mmm-kay?? -I liked this article on why can’t Hollywood get female journalists right? That was my first reaction after seeing Top 5, which I otherwise loved. –Gwyneth Paltrow is trying to convince us she eats Taco Bell. Adorable! –Rihanna and Leonardo DiCaprio both showed up at the same party last night in Los Angeles, adding fuel to the romance rumours. I’m having a rough week and I’m too fragile to process this information so I’m just going to pretend this isn’t really happening, ok? -Luckily, these photos of Idris Elba courtside are making my terrible week marginally less terrible. -Good on Vulture for trying to decipher Mortdecai’s bizarre marketing campaign. I still have no idea what this movie is. -I’m wary of NBC’s Heroes reboot, but intrigued by the news that charm bomb Zachary Levi has signed on. -In other NBC news, critics at the TCAs today when crazy for the promo of Aquarius, in which David Duchovny plays an FBI agent investigating Charles Manson in ’67. It airs this summer, the same time Gillian Anderson returns to NBC in Hannibal. Mini X Files reunion! -Also on NBC, Dolly Parton is developing a series of 2-hour TV movies. I’m going to watch the crap out of those. -It’s really over. Nick Cannon has reportedly filed for divorce from Mariah Carey after 6 years of marriage. -Parks and Rec fans: you may soon be able to order the Cones of Dunshire. As someone who spends a large amount of time trying to avoid getting pulled into games of Settlers of Catan, this news terrifies me. -I’m a big fan of Mary Elizabeth Winstead, but I’m not sure about A&E’s remake of The Returned. The preview looks like they’re staying very true to the French version, but I can’t imagine how that can be true, especially since the original tells you (SPOILER ALERT) absolutely nothing about why people suddenly start rising from the dead. I can’t imagine American audiences will embrace such a cryptic show.